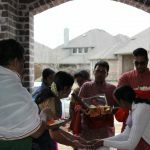 There is a way to celebrate every event in Bhagavata Dharma – be it a house-warming, a wedding anniversary or a baby-shower. 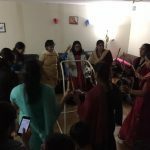 Being blessed to tread on this benign path of Bhagavata Dharma by our Guru Maharaj His Holiness Maharanyam Sri Muralidhara Swamiji, GOD Satsang in Norwood Massachusetts decided to celebrate a baby-shower of an expecting family thus. Invitations were sent out and friends and family turned up on the evening of Saturday March 18th, 2017. 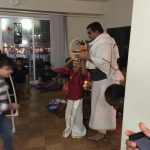 As they heard the chanting of Mahamantra Kirtan going on, they joined in along with their young children who are already students of our kids enrichment program. 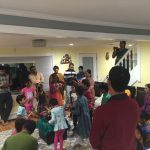 After Mahamantra Kirtan, Madhura Gitam was sung, invoking the Sadguru, Satsangam, Bhagavatam and our Divine Couple Madhuri Sakhi sametha Premika Varadhan. Then it was time to read Srimad Bhagavatam. 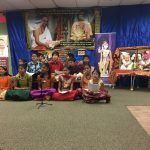 The kids led the chanting of the Dhyana Shlokas, that they have been taught in their classes. 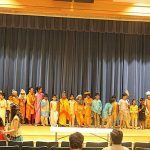 Then, the parayanam of Narayana Kavacham and 10th Canto commenced. 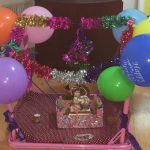 As the shlokas signifying the birth of Little Krishna were chanted, the little krishna was born in a cradle. With the completion of the chapter, little Krishna was put in a basket and carried by Vasudeva to Nanda Gokulam amidst singing ‘Karirul thanile…’. 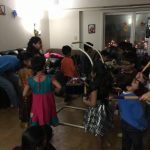 Kids, the ladies and gents – all gopas and gopis, blissfully celebrated Nandotsav around our little Krishna’s cradle-jhoola. 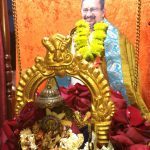 Followed by the Nandotsav, Narayananji discoursed on the path of Bhagavata Dharma and on the birth of Krishna. The event concluded with Harathi to the divine couple and prayers for the expecting couple!